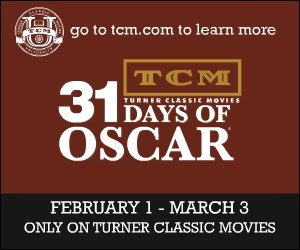 This year's 31 Days of Oscars, the festival hosted by Turner Classic Movies, is by far the best they've done. The clever folks at TCM came up with a University theme in which they grouped movies into courses and those courses into departments. Wonderful! This suits me quite perfectly. When I graduated with my Master's last year, I felt as though there was a big void left in my life. No more night classes, no more homework, no more bonding with other students, no more learning. I have since filled the void by watching, studying and writing about classic films, all of which has translated into putting more of an effort into this little blog of mine. So I think I may be the perfect candidate to study at TCM University. So please do me a favor and attend at least one of these year's courses in TCM University. Click on the banner below to go to the official TCMU website. Also take the opportunity to sign up for the TCM Fan Community which is currently in the works. Besides, there are lots of fun things to do on this site, it's very interactive. So check it out! As I can't get the US edition of TCM, the website will have to do for me. The European version of TCM is unfortunately not the same thing as the real thing. I'm excited about the theme this year too! My favorite day so far was Architecture. Which is funny, because I almost studied architecture. The only quibble I have with 31 DOO this year is that the wins and nominations aren't listed before each film this time. Jonas - Poor Jonas! TCM Europe needs to get up to speed. Casey - What are you studying now? I guess I don't miss the listings of wins and nominations mostly because I'm more interested in the grouping of films. I'm weird. What an interesting idea. I have to check out what courses are next!